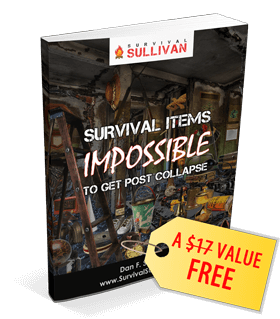 Containers are a vital survival commodity that will nowrt necessarily be easy to produce or procure if or when SHTF. They are vitally important for gathering, carrying and storing things, yet older more traditional containers such as wicker baskets are often thought of now a novelties or purely decorative items. 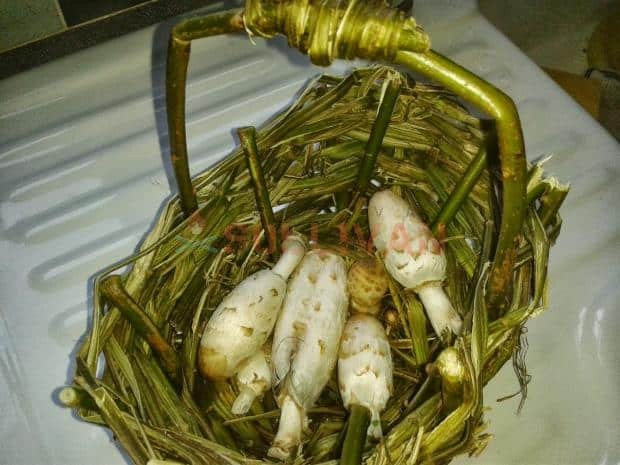 Photo: a grass coil basket used for collecting a delicious meal of St. Georges Mushrooms. While it is true that they are decorative and beautiful in their own right, these things are very functional and may be your only option when modern options are hard or impossible to find. Baskets and containers have been made for millennia from the materials found in nature. Popular options for container manufacture are the folded bark of birch, elm and some species of poplar. 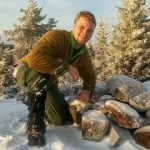 These types of container can even be made watertight, in a similar way to a birch bark canoe and used to cook food and boil water using rocks heated on a fire. 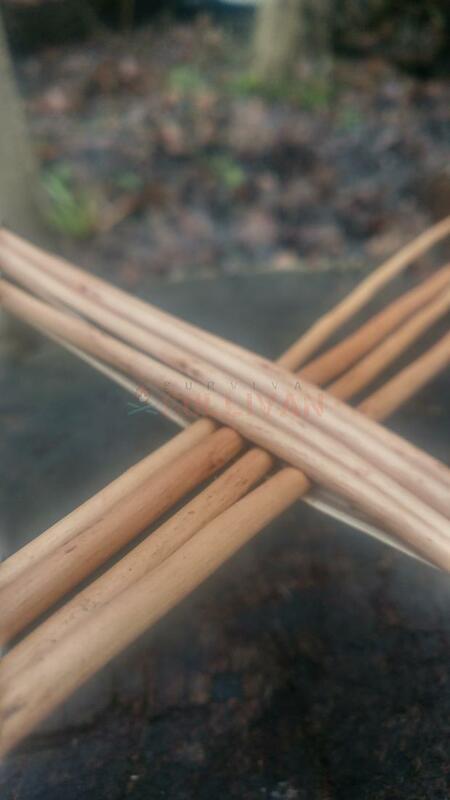 Wicker basketry was traditionally done with flexible hard wood wands such as willow, these rods are sometimes called withies, strictly though withies are young shoots which are processed in such a way as to make them particularly flexible and therefore suitable for use as improvised bindings. Before they are cut they are bent and twisted along their entire length to separate the fibers of the wood from each other and then they are cut off at the base. These withies can then be coiled up are incredibly strong, they have been used to secure rafts, dwellings and for other secure bindings for centuries. The best species for these withies are things like willow, hazel and alder. 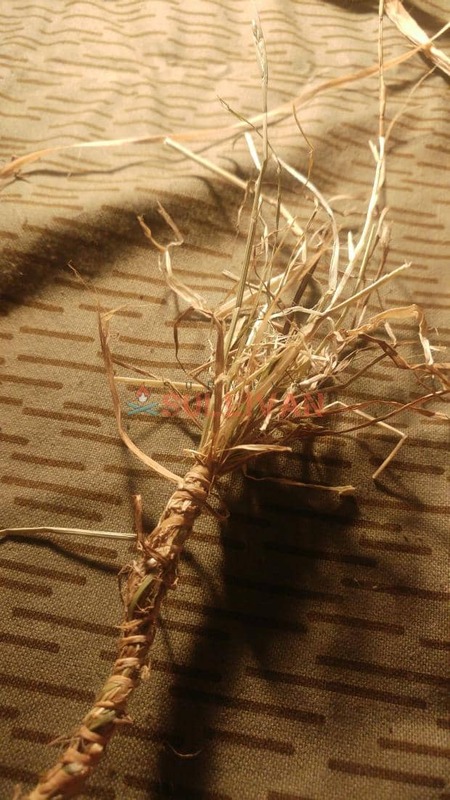 Whether you are harvesting withies or strait rods for basketry and other tasks they should be harvested from hard wood trees as when cut hard wood trees will sprout new shoots rather than dying. This method of harvesting hard woods without killing the tree is called coppicing and has been done historically to obtain material for survival and traditional crafts. Traditionally, oak was coppiced so that it’s bark could be harvested and used for tanning animal hides into leather, sweet chestnut was coppiced and used for timber framed buildings, fence posts and other construction projects. Elm was coppiced for its moisture resistant wood and used to build jetties and even pipes. Alder was coppiced for arrow shafts and later used to make exceptional charcoal for gunpowder manufacture. Hazel is one of the most commonly coppiced species and because of it’s straight and relatively fast growth it was, and still is often used for making ‘hurdles’ or small mobile fence panels. These might be particularly useful for penning animals, indeed that is what they were used for traditionally. If your survival strategy is going to include bugging into a location where you will keep livestock. 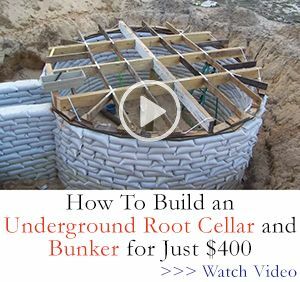 These hurdles can be built from round rods or they can be split along their length, which makes them more flexible and lightens the hurdle, being able to produce these hurdles will allow you to effectively fence in your homestead even without modern wire. These are just a few examples of the use of coppiced hardwood rods but to produce baskets and containers willow is likely to be the first choice re is a use for a range of coppiced woods but willow is particularly valuable as it regrows so fast. Nowadays it is often grown as a sustainable fuel source which can be harvested and chipped up and used to form wood fuel pellets for biofuel boilers to heat homes. In this instance though we want young willow wands for making baskets and containers, they can even be used to make fish traps. If you can be selective and prepare in advance for your basketry you should harvest your willow during winter as this promotes the best regeneration for the tree but in terms of your basketry project it doesn’t matter when you harvest them. 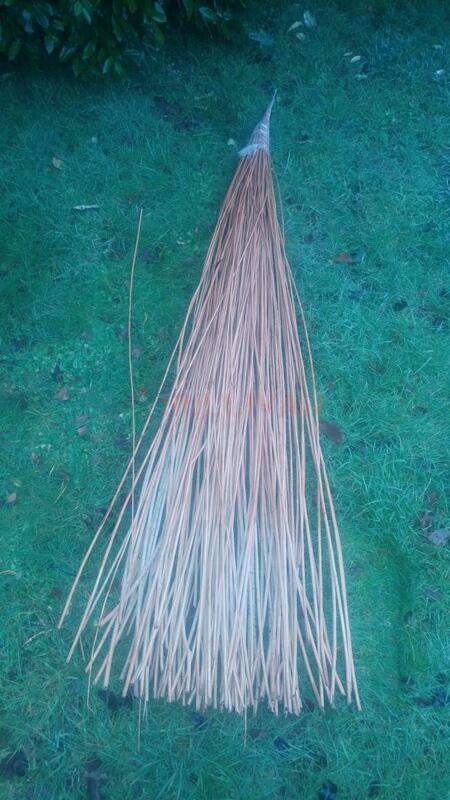 In fact, if you want to strip the bark off your willow before using it for basketry, like in the pictures here, it is easier to do that with willow harvested in the summer. 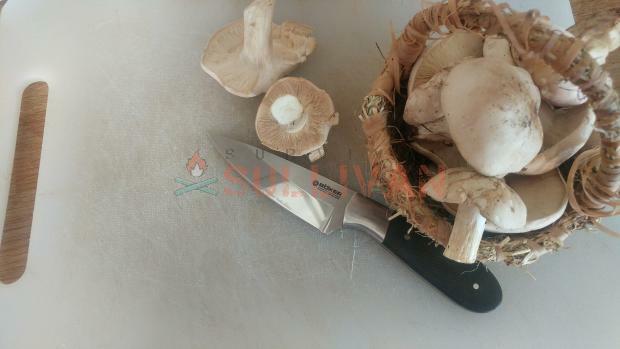 When the sap is up in the spring and summer and the leaves are growing it is really easy to peel the bark of willow and this can then even be used to make strong cordage. 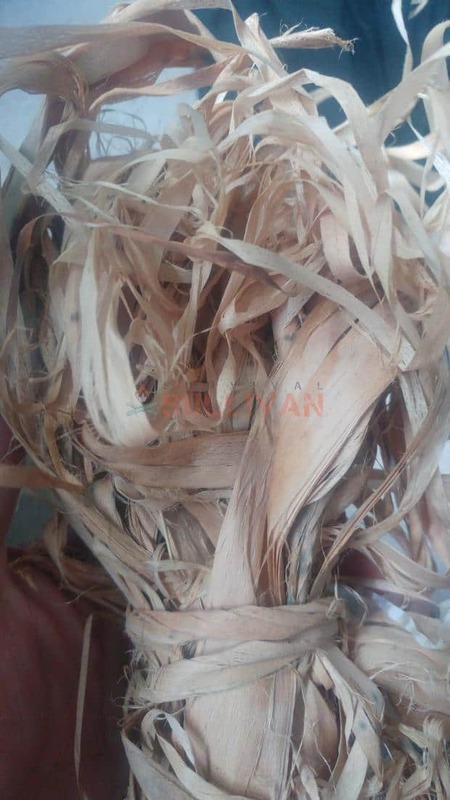 Willow which has been stripped of its bark will look pure white at first, but as it dries will take on a pale brown color and is known as ‘buff’ willow. You don’t have to do this though it’s just as easy to make baskets with willow with the bark on as off. One benefit of weaving with the bark on is that you can take advantage of the color of variations in the color of bark, there are many species of willow with bark ranging from black to various shades or brown, green and grey but dog wood can also be harvested in suitable dimensions and mixed with the willow to give bands of color with it’s bright red or yellow bark. Once you have collected your materials; the project I show for you here was all done willow but other materials are acceptable, it can be stored. The rods will dry out and last for ages if kept dry. These dry rods can then be re-wetted and used at your leisure for your projects. 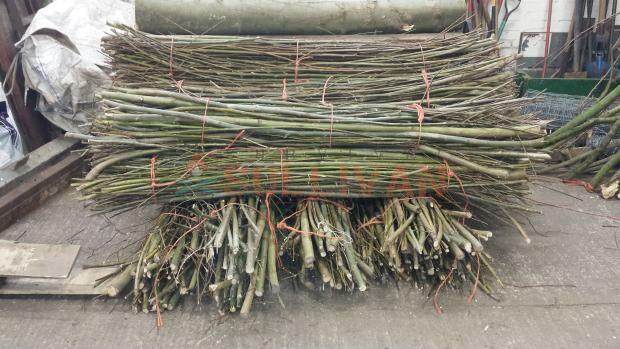 To produce a regular supply of suitable basketry willow you will need to regularly coppice the plants you are going to be using, the ideal thickness for most of these projects is no more than about 5 millimeters (0.2 inches). Anything much over a year old will be far too thick so you will need to coppice regularly. 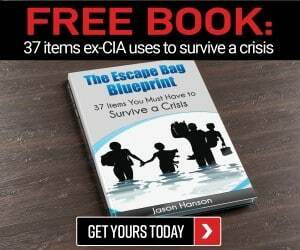 Base: The bottom of a basket or container. Spokes: The foundation of a round or oval basket. They fan out as the spokes of a wheel at the base and also then go up the sides of the basket vertically. Known as stakes in square or rectangular baskets. Weaver: Individual horizontal rods woven horizontally into the around the sides of the basket. Packing: Pushing the weavers tightly together. Splicing: Adding additional weavers to the basket when the previous one has grown too short. Shaping: Using your weaver to splay out or pull together the spokes or stakes of a basket under construction..
Photo: dried ‘buff’ willow soaking up the dew in wet grass to make it more supple ready for weaving. 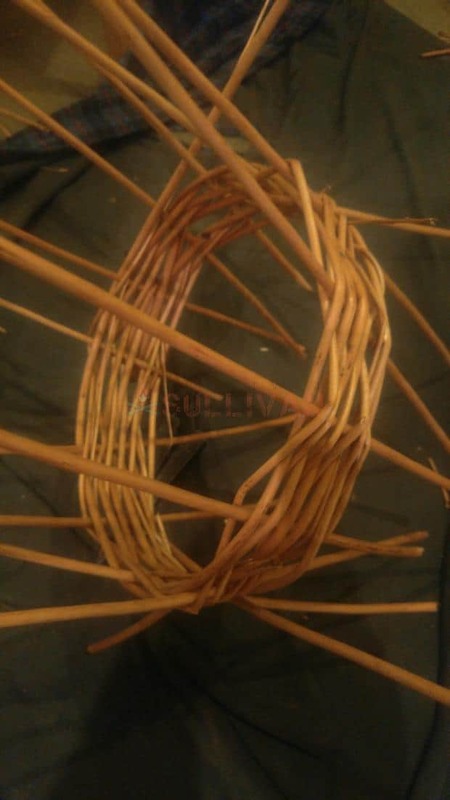 I would always suggest drying and re-wetting the material you want to use for basketry as once it dries it will shrink slightly, if the willow is used fresh this shrinkage will warp the completed container and allow gaps to open up in it. Drying and re-wetting, on the other hand, will negate this shrinkage as the re-wetting does not swell the willow back to its original size rather it just makes it more supple and flexible. An hour or two of soaking in water should be enough to make willow supple enough to work with, this is important as the thin ends of the willow rods will be far too brittle and will break as you try and flex them without this wetting and the ticker ends will not bend enough. You can see in the above photo that as well as wrapping alternately around the front and then back of each ‘spoke’ of the basket the two rods alternate from being on top to underneath. This makes the basket very secure. The project I will show you is a fish funnel trap, so it doesn’t need a flat bottom. It has one open end which is then filled with a smaller wicker funnel to allow small fish, eels and cray fish to enter but not escape and the other end tapers to a point. To achieve this point, the ends of several rods can be bound together with another one. Once the ends are lashed you can start weaving your fish trap from the other end allowing the spokes to protrude beyond where the first weave begins. These can be trimmed to the right size later as can the ends of each rod as you come to its end and need to splice in new ones. This process of splicing in new rods as you finish the previous one is very simple, as one weaver runs out a new one will need to be spliced in to allow the basket to be completed. 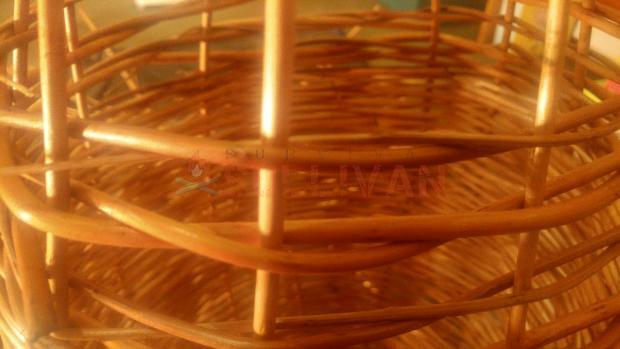 You will gradually build up the walls of the basket or fish trap by packing each layer of weavers tightly together. For a basket this packing is essential to produce a tightly woven, strong basket which can be used for carrying things, particularly for foraging for things such as berried which might fall through a loose weave and be lost. The weave of a fish trap can be slightly looser as long as the small fish and cray fish can still be contained without being able to swim out. Four rods must be split through their center for a few inches and then another four rods pushed through the splits forming an ‘x’ shape. This cross becomes the center of you basket. To secure it take two more rods and these will need to be woven around the cross, the ends can be secured in the splits, one rod will need to be woven alternately over and then under the arms of the cross with the other rod being woven in the reverse pattern. 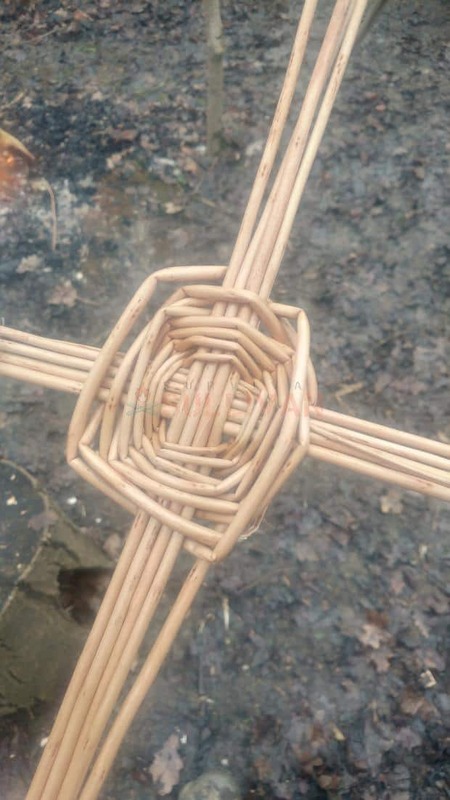 Once you have reached this stage you can bend the rods forming the cross away from each other so that the cross begins to resemble the spokes of a bicycle wheel and then from then on weave between each individual ‘spoke’. From there continue exactly as you did with the fish trap to create a basket with a flat bottom. 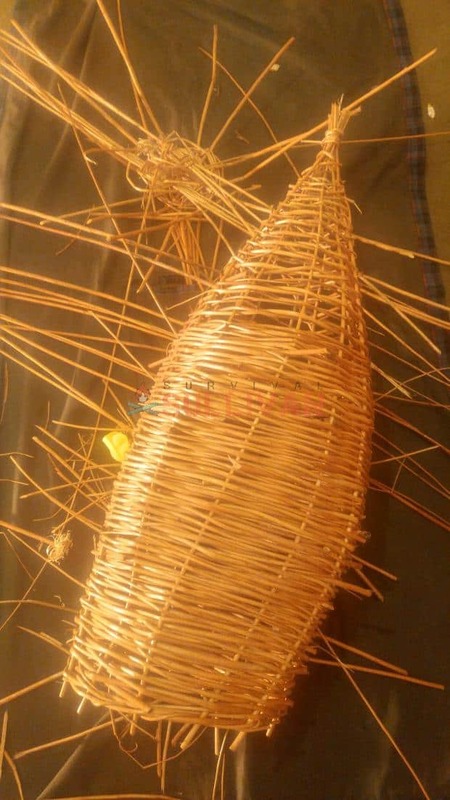 Any number of gathering baskets or even makeshift back packs can be made with woven willow, and they are light, strong and they look good but woven baskets are not your only option for making containers from natural material, while the wicker work does lend itself to fish traps like the one shown here there are other methods of making very functional and strong baskets. 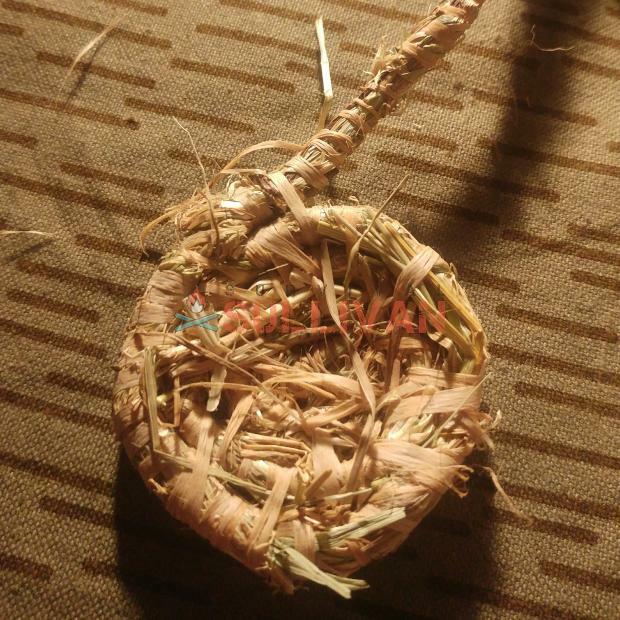 Alternative materials can be used like the basket here made of just a few willow rods and stinging nettle stems. 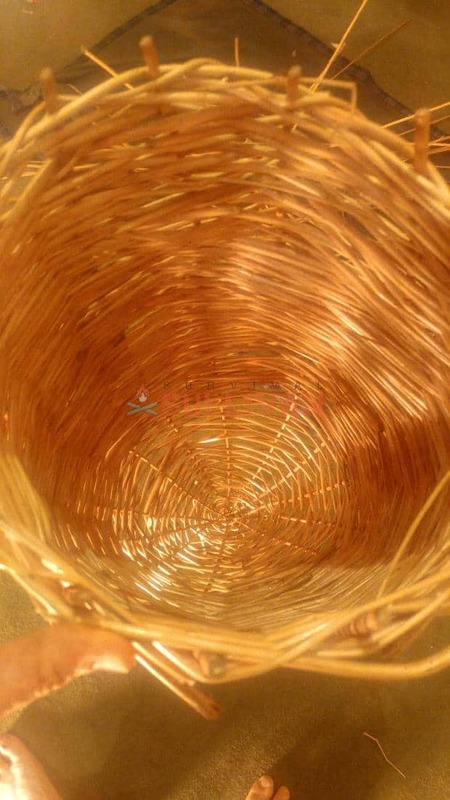 Coil baskets are simply that; baskets made of coils of, well almost anything really. In the example pictured I have used hay and lime bast. Lime bast is the fermented and dried inner bark of the lime tree. 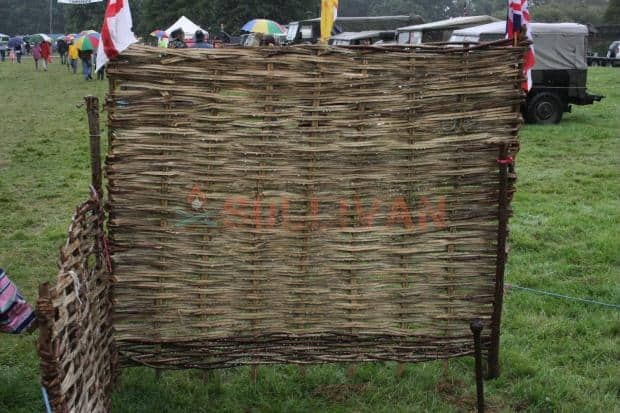 Through a process called retting it is separated from the outer bark and becomes soft, supple and flexible and can be used to make strong cord or used as it is in this basketry project. Making bast takes a lot of time though and is not a vital part of this project, you could use raffia, wool or jute twine. Photo: lime bast ready to be turned into strong cord or used for your coil basketry project. First you need to select your materials, your bulk material, hay in this case but it could be any fibrous material from dry grass to raffia or dried reedmace leaves, which will form the basis of your basket and the ‘coil’ that it will be made from, and your wrapping material which will be used to tightly wrap the bulk material forming the coil that will become your basket and also securing each layer of the coil to the one below. Once you have this central point, you need to continue to wrap your bulk material. Using this first twist of material as your central point begin to coil everything else around it. It is easiest to form up to a foot or even two of twisted, wrapped material at a time before coiling it. As you coil it, you will need to secure each new coil to the one inside it using the same wrapping material that you are forming your coil with. When securing the layers make sure you don’t pull them so tight that the layer are cinched so tightly that gaps open up between the layers. To get your wrapping between layers you can use a large needle or a marlin spike, but a net needle works just as well. You won’t need to thread the wrapping material through the needs, it probably wouldn’t fit anyway unless your needle has a really big eye but just use your tool of choice to open up a gap between the layers to give yourself a big enough hole to work with. These baskets once complete can be fitted with a handle or left as they are if you decide you don’t need the handle. To fit a handle form a robust wrap of material in exactly the same way that you have made the coil, probably slightly thicker though. Tuck one end through the coil of the basket towards the top edge, I would go two or even three layers down from the edge though to add strength. Once it is tucked through fold the end up and double it over against the handle, now use your binding material to securely whip the end of the handle in place. Now bend the rest of your handle over and repeat on the other side of the basket. Now you have a useful basket for collecting foraged food or gathering other resources. The beauty of this method of basketry is that you can create any shape you want, you can easily go on from a simple open topped basket to form vase shaped vessels which you could waterproof and use to hold liquids. Because there are no significant gaps between the materials of the basket you can easily coat the inner surface of this kind of container with something like birch tar which you can also source from nothing but natural materials and which will make these containers completely waterproof. 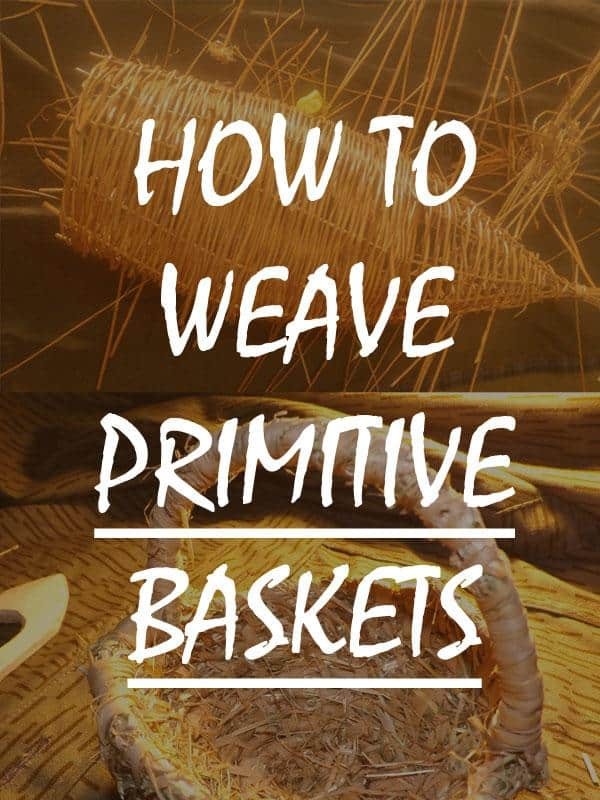 With all these options for basketry and weaving you can go ahead with lots of projects and equip yourselves with a skill that will be vitally important post SHTF.